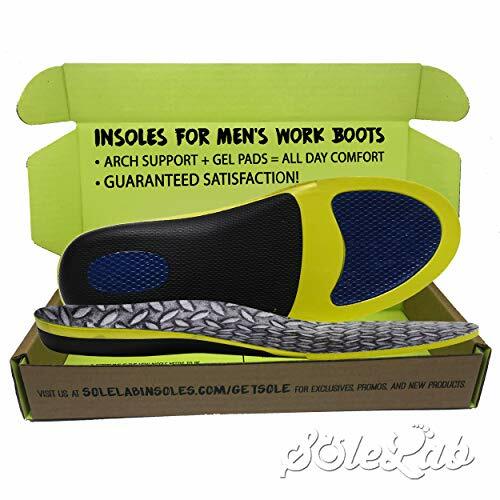 The Sole Lab insoles for mens work boots full length comfort orthotic replacement inserts with adaptive arch and gel inserts are specifically designed for those standing on hard surfaces all day with no break for their feet. The two specially placed Gel pads work to disperse pressure away from high impact areas - reducing discomfort and fatigue in the feet and legs. Let your insole take on some of the work load, you have enough going on. Easily Trimmable To Your Exact Size! 1. Remove old insole from shoe. 2. Place the old insole on top of your new Sole Lab insole, align the heels. 3. Determine if the new insole needs to be trimmed at the toe. 4. If so, use scissors to carefully cut the toe area of the Sole Lab insole to the correct size. 5. Insert into shoes and enjoy miles & miles of foot bliss! HEAVY DUTY PAIN RELIEF- Alignment provided by our Insoles helps to reduce back pain. COMFORT and ENERGY- Our technology-driven materials give you the boost you need to get through your work day. This insole provides lasting comfort and rebound, without the dreaded pack-out. GUARANTEED SATISFACTION because of a 30 day full money back guarantee and a trusted Sole Lab warranty. We are so confident in our products that we have no problem giving you every penny back if you're unhappy with your purchase. You won't see promises like that from big box brands! ANTI FATIGUE-Gel pads plus arch and heel support team up to reduce the strain on your feet. PERFECT FIT for mens work boots, hiking boots and casual boots. If you have any questions about this product by Sole Lab, contact us by completing and submitting the form below. If you are looking for a specif part number, please include it with your message.